System Center 2012 Configuration Manager supports the upgrade of the version of a Configuration Manager site by installing a service pack or upgrading to a later release like System Center 2012 R2 Configuration Manager. When you upgrade Configuration Manager, plan for the changes that are required to install the new version, and the changes that the new version introduces. Changes in a new product version might require you to modify pre-upgrade configurations to support the upgrade, such as new prerequisites for site system roles. Also plan to modify post-upgrade configurations, which include the reconfiguration of some settings and the upgrade of Configuration Manager clients and Configuration Manager consoles. System Center 2012 Configuration Manager does not support an upgrade from Configuration Manager 2007 or earlier product versions. Additionally, you cannot share a site system server or site system role between a Configuration Manager 2007 site and a System Center 2012 Configuration Manager site. Before you install a System Center 2012 Configuration Manager site system role on a computer, you must uninstall all site system roles from the Configuration Manager 2007 site. The only exceptions are distribution points that you share between hierarchies during migration. For more information, see the Share Distribution Points Between Source and Destination Hierarchies section in the Planning a Content Deployment Migration Strategy in System Center 2012 Configuration Manager topic. In a hierarchy of sites, you must upgrade the top-level site before you can upgrade a child site. For example, if you will upgrade a hierarchy with a central administration site and a primary site to System Center 2012 R2 Configuration Manager and both sites are already at SP1, you must upgrade the central administration site to System Center 2012 R2 Configuration Manager before you can upgrade the primary site. Use the information in the following sections to plan for upgrading Configuration Manager sites to a new version. Several new versions of the Microsoft System Center 2012 Configuration Manager have been made available since System Center 2012 Configuration Manager was first released. The status of your software assurance coverage and the version of Configuration Manager that you currently use determines your installation and upgrade path. Upgrade your installation: If you have a System Center 2012 R2 Configuration Manager installation, you use the System Center 2012 Configuration Manager SP2 media to install the latest patches and automatically upgrade to System Center 2012 R2 Configuration Manager SP1. New installation: Install System Center 2012 Configuration Manager SP2, and then upgrade to System Center 2012 R2 Configuration Manager SP1 at the top-tier site of your hierarchy. Upgrade your installation: If you have a System Center 2012 Configuration Manager SP1 installation, you can upgrade to System Center 2012 Configuration Manager SP2. 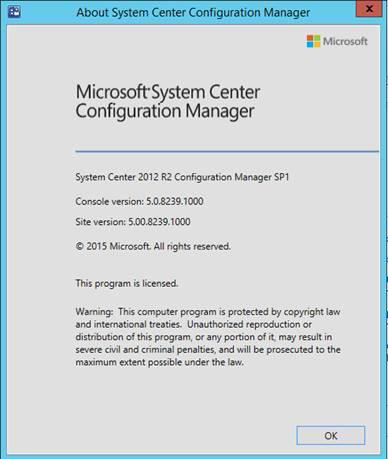 New installation: Install System Center 2012 Configuration Manager SP2. Configuration Manager supports installing System Center 2012 Configuration Manager Service Pack 1 (SP1) to upgrade a site that runs System Center 2012 Configuration Manager with no service pack. You can run the service pack upgrade on the site servers of central administration sites and primary sites. After a primary site upgrades to System Center 2012 Configuration Manager SP1, you can then use the Configuration Manager console to upgrade secondary sites to Configuration Manager SP1. Use the information in the following sections to help you plan for the upgrade to Configuration Manager SP1. You can install a new System Center 2012 Configuration Manager SP1 site, or upgrade an existing site that runs Configuration Manager with no service pack. You can expand a stand-alone primary site that runs Configuration Manager SP1. When you expand a primary site, you install a new central administration site that becomes the parent site of the existing primary site. Use the information in the following check list to help you identify and plan for pre-upgrade configuration modifications and additional actions that are related to upgrading your sites and hierarchy to Configuration Manager SP1. Ensure that your computing environment meets the supported configurations that are required for upgrading to System Center 2012 Configuration Manager SP1. Before you upgrade to Configuration Manager SP1, install the required prerequisites on each computer that hosts a site system role. Several site system roles require new or upgraded prerequisites. Make a Full Site and Database backup before the upgrade or any change. Disable all Site Maintenance tasks. Insert System Center Configuration Manager 2012 SP2 media into the computer. Temporarily stop any antivirus software on the System Center Configuration Manager servers. For example, to deploy an operating system, Configuration Manager SP1 uses the Windows Assessment and Deployment Kit (Windows ADK) instead of Windows Automated Installation Kit (Windows AIK). Before you run Setup, you must download and install Windows ADK on the site server and on each computer that runs an instance of the SMS Provider. For general information about supported platforms and prerequisite configurations, see Supported Configurations for Configuration Manager. For information about how to use the Windows ADK with Configuration Manager, see the Prerequisites For Deploying Operating Systems in Configuration Manager topic in the Deploying Software and Operating Systems in System Center 2012 Configuration Manager guide. Perform a test upgrade of the database before you run the Configuration Manager 2012 R2 SP1 upgrade. In the window that appears, click Begin TestDBUpgrade. Click Yes if you are prompted about whether to continue. You can trace the test upgrade of the database by using CMTrace to open C:\ConfigMgrSetup.log. When you see the following log entry, you can perform the actual upgrade. To upgrade, insert the System Center 2012 Configuration Manager SP2 media. This automatically updates the site to System Center 2012 R2 Configuration Manager SP1. Select the Upgrade this configuration Manager site option. Open registry editor, and locate the HKLM\Software\Microsoft\SMS\Setup\ key. If the installation succeeded, the CULevel value will be 2. In System Center Configuration manager console, navigate to Software Library / Packages / Configuration Manager Updates. You’ll see that your CU2 updates packages have been created. Go ahead and Distribute Content to your distribution points. Open the System Center Configuration manager console. Go to Administration / Site Configuration / Sites. Click the Hierarchy Settings on the top ribbon. Select the Automatic Client Upgrade tab. The Upgrade client automatically when the new client updates are available check box is now selected. Review your time frame, and adjust it to your needs. Click the Secondary Site name. On the upper tools pane, click Upgrade. For more information, see Planning to Upgrade System Center 2012 Configuration Manager. Review the site and hierarchy status and verify that there are no unresolved issues. Before you upgrade a site, resolve all operational issues for the site server, the site database server, and site system roles that are installed on remote computers. A site upgrade can fail due to existing operational problems. For information about the status of sites and site system roles, see Monitor Configuration Manager Sites and Hierarchy. Install all applicable critical updates for operating systems on computers that host the site, the site database server, and remote site system roles. Before you upgrade a site, install any critical updates for each applicable site system. If an update that you install requires a restart, restart the applicable computers before you start the service pack update. For more information, see Windows Update. Configuration Manager cannot successfully upgrade a primary site that has a database replica for management points enabled. Disable database replication before you create the backup of the site database to test the database upgrade, and before you upgrade the production site to Configuration Manager SP1. Reconfigure software update points that use NLBs. Configuration Manager cannot upgrade a site that uses a Network Load Balancing (NLB) cluster to host software update points. For more information, see the Upgrade from Configuration Manager with No Service Pack to Configuration Manager SP1 section in the Planning for Software Updates in Configuration Manager topic. Back up the site database at the central administration site and primary sites. Before you upgrade a site, back up the site database to ensure that you have a successful backup to use for disaster recovery. For more information, see Backup and Recovery in Configuration Manager. Disable all site maintenance tasks at each site for the duration of that site’s upgrade. Create a copy of each built-in collection that you have modified. When you upgrade to Configuration Manager SP1, the built-in collections are overwritten in the site database. If you have customized a built-in collection, create a copy of that collection before you upgrade. In Configuration Manager SP1, the built-in collections are read-only and cannot be modified. Configuration Manager SP1 introduces new prerequisite checks. Before you upgrade a site, you can run the Prerequisite Checker independently from Setup to validate that your site meets the prerequisites. When you upgrade the site, Prerequisite Checker runs again. For more information, see the Prerequisite Checker section in the Install Sites and Create a Hierarchy for Configuration Manager topic. For information about prerequisite checks, see Technical Reference for the Prerequisite Checker in Configuration Manager. Download prerequisite files and redistributable files for Configuration Manager SP1. Use Setup Downloader from the Configuration Manager SP1 source media to download prerequisite redistributable files, Configuration Manager SP1 language packs, and the latest product updates for the service pack upgrade. For information about Setup Downloader, see the Setup Downloader section in the Install Sites and Create a Hierarchy for Configuration Manager topic. Plan to manage server and client languages when you upgrade a site. Configuration Manager SP1 supports the same server and client languages as Configuration Manager with no service pack, and it also supports additional languages that are introduced with Configuration Manager SP1. However, when you upgrade to Configuration Manager SP1, the site upgrade installs new versions of each language pack. When you run Setup, Setup reviews the current language configuration of your site, and then identifies the language packs that are available in the folder where you store previously downloaded prerequisite files. You can then affirm the selection of the current server and client language packs, or change the selections to add or remove support for languages. Only those language packs are available that are available with the prerequisite files that you download. Server and client language packs are service pack version-specific. You cannot use the language packs from Configuration Manager with no service pack to enable languages for a Configuration Manager SP1 site. If you have previously installed a language pack for servers or clients at a site, and a Configuration Manager SP1 version of that language pack is not available with the prerequisite files, that language cannot be selected. Support for that language is removed from the site when it upgrades. For more information about language packs, see the Planning for Client and Server Operating System Languages in Configuration Manager section in the Planning for Sites and Hierarchies in Configuration Manager topic. Plan for new site system role prerequisites. Prerequisite Checker for Configuration Manager does not verify the prerequisites for site system roles on the site server or on remote computers. Several site system roles have new prerequisites for Configuration Manager SP1. Before you upgrade a site, verify that each computer that hosts a site system role meets any new prerequisites for Configuration Manager SP1. During a site upgrade, Configuration Manager automatically upgrades site system roles at the site by reinstalling each site system role. When prerequisites are not met, the site system role might not reinstall or might reinstall, but might fail to operate correctly. For information about prerequisites for site system roles, see the Site System Requirements section in the Supported Configurations for Configuration Manager topic. Review the list of considerations for site upgrades. When you upgrade a site, some features and configurations reset to a default configuration. To help you plan for these and related changes in Configuration Manager SP1, review the information in the Considerations for Upgrading to Configuration Manager SP1 section in this topic. Test the database upgrade process on a copy of the most recent site database backup. Before you upgrade a Configuration Manager central administration site or primary site to a new service pack, plan to test the site database upgrade process on a copy of the site database. You should test the site database upgrade process, because when you upgrade a site, the site database might be modified and although a test database upgrade is not required, it can identify problems for the upgrade before your production database is affected. A failed site database upgrade can render your site database inoperable and might require a site recovery to restore functionality. Configuration Manager supports neither the backup of secondary sites nor the test upgrade of a secondary site database. Although the site database is shared between sites in a hierarchy, plan to test the database at each applicable site before you upgrade that site. If you use database replicas for management points at a primary site, disable replication before you create the backup of the site database. It is not supported to run a test database upgrade on the production site database. Doing so upgrades the site database and could render your site inoperable. For more information, see the Test the Configuration Manager Site Database for the Upgrade section in the Upgrade Configuration Manager to a New Service Pack topic. Restart the site server and each computer that hosts a site system role to ensure that there are no pending actions from a recent installation of updates or from prerequisites. Internal process that is company-specific. Starting at the top-level site in the hierarchy, run Setup.exe from the Configuration Manager SP1 source media. After the top-level site completes the upgrade to Service Pack 1, you can begin the upgrade of each child site. Complete the upgrade of each site before you begin to upgrade the next site. Until all sites in your hierarchy upgrade to the same service pack version, your hierarchy operates in a mixed service pack version mode. For information about how to run the service pack installation, see the Upgrade a Configuration Manager Site section in the Upgrade Configuration Manager to a New Service Pack topic. For information about operating a Configuration Manager hierarchy in mixed mode, see the Interoperability between Sites with Different Service Pack Versions in System Center 2012 Configuration Manager section in the Interoperability between Different Versions of Configuration Manager topic. Upgrade stand-alone Configuration Manager consoles. By default, when you upgrade a central administration site or primary site, the installation also upgrades a Configuration Manager console that is installed on the site server. However, you must manually upgrade each Configuration Manager console that is installed on a computer other than the site server. When you use a Configuration Manager console that is of a lower service pack version than the site that you connect to, the console cannot display or create some objects and information that are available in the new service pack version. When you use a Configuration Manager console that is of a higher service pack version than the site that you connect to, the connection is blocked. For more information see Interoperability for the Configuration Manager Console. When you upgrade a Configuration Manager console, the installation process uninstalls the existing Configuration Manager console, and then installs the new version of the software. Therefore, to upgrade a Configuration Manager console on computers other than site servers, you can use any method that Configuration Manager supports to install the Configuration Manager console. These supported methods can include a manual installation or a deployment that installs the console. Close an open Configuration Manager console before you start the upgrade. The installation process cannot upgrade an open console. For more information about how to install the Configuration Manager console, see the Install a Configuration Manager Console section in the Install Sites and Create a Hierarchy for Configuration Manager topic. Reconfigure database replicas for management points at primary sites. For more information, see the Configurations for Using a Database Replica section in the Configure Database Replicas for Management Points topic. Reconfigure any database maintenance tasks you disabled prior to the upgrade. After you upgrade a primary site, plan to upgrade clients that are assigned to that site. Although a Configuration Manager primary site or secondary site can support communication from clients that have a lower service pack version, this communication should be a temporary configuration. Clients that run a previous service pack version of Configuration Manager cannot use the new functionality that is available with the new service pack version of Configuration Manager. When you upgrade a client, the current client software is uninstalled and the new client software version is installed. To upgrade clients, you can use any method that Configuration Manager supports. When you upgrade the top-level site of a hierarchy to a new service pack, the client installation package on each distribution point in the hierarchy is also updated. When you upgrade a primary site, the client upgrade package that is available from that primary site is updated. For information about how to upgrade existing clients and how to install new clients, see How to Install Clients on Windows-Based Computers in Configuration Manager. Use the following information to help you prepare for changes to sites and the hierarchy when you upgrade to Configuration Manager SP1. The site performs a site reset, which includes a reinstallation of all site system roles. If the site is the top-level site of a hierarchy, it updates the client installation package on each distribution point in the hierarchy. If the site is a primary site, it updates the client upgrade package for that site. Ensure that clients that are assigned to each primary site upgrade and install the client software for the new service pack. Upgrade each Configuration Manager console that connects to the site and that runs on a computer that is remote from the site server. At primary sites where you use database replicas for management points, reconfigure the database replicas for Configuration Manager SP1. Actions that affect configurations and settings: When a site upgrades to Configuration Manager SP1, some configurations and settings do not persist after the upgrade or are set to a new default configuration. The following table includes configurations and settings that do not persist or that change, and provides details to help you plan for them during a site upgrade. When you upgrade to Configuration Manager SP1, custom summarization schedules for software updates or software update groups are reset to the default value of 1 hour. After the upgrade finishes, reset custom summarization values to the required frequency. Configuration Manager supports installing System Center 2012 R2 Configuration Manager to upgrade a site that runs System Center 2012 Configuration Manager SP1. You can run the upgrade on the site servers of central administration sites and primary sites. After a primary site upgrades, you can then use the Configuration Manager console to upgrade secondary sites to System Center 2012 R2 Configuration Manager. It is not supported to upgrade a site that runs System Center 2012 Configuration Manager with no service pack to System Center 2012 R2 Configuration Manager. Instead, you must first upgrade to System Center 2012 Configuration Manager with SP1, and then upgrade to System Center 2012 R2 Configuration Manager. Use the information in the following sections to help you plan for the upgrade to System Center 2012 R2 Configuration Manager. You can install a new System Center 2012 R2 Configuration Manager site, or upgrade an existing site that runs System Center 2012 Configuration Manager with SP1. When you run Setup to install a new primary site or central administration site, you can select non-default locations for the site database files. The option to specify non-default file locations is not available when you specify a SQL Server cluster. Use the information in the following check list to help you identify and plan for pre-upgrade configuration modifications and additional actions that are related to upgrading your sites and hierarchy to System Center 2012 R2 Configuration Manager. Ensure all sites in the hierarchy run System Center 2012 Configuration Manager with SP1. You cannot upgrade a site to System Center 2012 R2 Configuration Manager until all sites in the hierarchy run System Center 2012 Configuration Manager with SP1. The version of cumulative updates for Configuration Manager that are installed at sites is not evaluated and you can upgrade a System Center 2012 Configuration Manager SP1 site regardless of the cumulative update version that is installed, or even when no cumulative update is installed. Ensure that your computing environment meets the supported configurations that are required for upgrading to System Center 2012 R2 Configuration Manager. Before you upgrade to System Center 2012 R2 Configuration Manager, install the required prerequisites on each computer that hosts a site system role. Several site system roles require new or upgraded prerequisites. For example, to deploy an operating system, System Center 2012 R2 Configuration Manager uses Windows Assessment and Deployment Kit 8.1 instead of Windows Assessment and Deployment Kit 8.0. Before you run Setup, on the site server and on each computer that runs an instance of the SMS Provider you must uninstall the Windows Assessment and Deployment Kit 8.0, and then download and install Windows Assessment and Deployment Kit 8.1. For information about how to use the Windows Assessment and Deployment Kit 8.1 with Configuration Manager, see the Prerequisites For Deploying Operating Systems in Configuration Manager topic in the Deploying Software and Operating Systems in System Center 2012 Configuration Manager guide. Review requirements for any add-ins or extensions for Configuration Manager that you use. Before you upgrade a site, review available details for product add-ins and extensions that you use with Configuration Manager to ensure compatibility or potential issues during or after the upgrade of the Configuration Manager site. Configuration Manager cannot successfully upgrade a primary site that has a database replica for management points enabled. Disable database replication before you create the backup of the site database to test the database upgrade, and before you upgrade the production site to System Center 2012 R2 Configuration Manager. Configuration Manager cannot upgrade a site that uses a Network Load Balancing (NLB) cluster to host software update points. If you use NLB clusters for software update points, use PowerShell to remove the NLB cluster. (Beginning with Configuration Manager SP1, there is no option in the Configuration Manager console to configure an NLB cluster. For more information, see section in the Upgrade from Configuration Manager with No Service Pack to Configuration Manager SP1 section in the Planning for Software Updates in Configuration Manager topic. For more information about site maintenance tasks, see the Planning for Maintenance Tasks for Configuration Manager section in the Planning for Site Operations in Configuration Manager topic. System Center 2012 R2 Configuration Manager introduces new prerequisite checks. Before you upgrade a site, you can run the Prerequisite Checker independently from Setup to validate that your site meets the prerequisites. When you upgrade the site, Prerequisite Checker runs again. Download prerequisite files and redistributable files for System Center 2012 R2 Configuration Manager. Use Setup Downloader from the System Center 2012 R2 Configuration Manager source media to download prerequisite redistributable files, language packs, and the latest product updates for the product version upgrade. With System Center 2012 R2 Configuration Manager, when you plan to upgrade an existing secondary site that uses SQL Server 2012 Express with no service pack, or retry a failed secondary site installation, you must first apply cumulative update 2 to the SQL Server 2012 Express installation on the secondary site server. This is because, when System Center 2012 R2 Configuration Manager installs SQL Server Express as part of a new secondary site installation, it installs SQL Server 2012 Express with no service pack and is unable to install the required cumulative update 2 as part of the installation. When you direct Configuration Manager to install SQL Server Express as part of a new site, the prerequisite check does not detect an existing installation of SQL Server Express, and then installs SQL Server Express as part of the site installation. During an upgrade or retry, if an existing version of SQL Server Express is detected that does not meet the minimum version requirement for System Center 2012 R2 Configuration Manager of SQL Server 2012 Express with no service pack and cumulative update 2, the upgrade or retry will fail. System Center 2012 R2 Configuration Manager supports the same server and client languages as prior versions. However, when you upgrade the site, the upgrade process installs new versions of each language pack. Server and client language packs are service pack version-specific. You cannot use the language packs from Configuration Manager SP1 to enable languages for a System Center 2012 R2 Configuration Manager site. If you have previously installed a language pack for servers or clients at a site, and a version of that language pack is not available with the prerequisite files of the upgrade files, that language cannot be selected. Support for that language is removed from the site when it upgrades. Plan for prerequisites for new site system roles, and ensure site system servers still meet prerequisite for installed site system roles. When you upgrade a site, some features and configurations reset to a default configuration. To help you plan for these and related changes in System Center 2012 R2 Configuration Manager, review the information in the Considerations for Upgrading to System Center 2012 R2 Configuration Manager section in this topic. Before you upgrade a Configuration Manager central administration site or primary site, plan to test the site database upgrade process on a copy of the site database. You should test the site database upgrade process, because when you upgrade a site, the site database might be modified and although a test database upgrade is not required, it can identify problems for the upgrade before your production database is affected. A failed site database upgrade can render your site database inoperable and might require a site recovery to restore functionality. It is not supported to run a test database upgrade on the production site database. Doing so upgrades the site database and could render your site inoperable. Also, do not restore the copy of the database that you use to test he database upgrade to the same SQL Server that hosts the production database. This is because the same SQL Server Service Broker endpoints can be used by each copy of the database, and messages sent to the copy during the upgrade test can be picked up by the production database, and vice versa. Install System Center 2012 R2 Configuration Manager. Starting at the top-level site in the hierarchy, run Setup.exe from the System Center 2012 R2 Configuration Manager source media. After the top-level site completes the upgrade and replication is Active, you can begin the upgrade of each child site. Complete the upgrade of each site before you begin to upgrade the next site. For information about how to run the upgrade installation, see the Upgrade a Configuration Manager Site section in the Upgrade Configuration Manager to a New Service Pack topic. When you upgrade a Configuration Manager console, the installation process uninstalls the existing Configuration Manager console, and then installs the new version of the software. Therefore, to upgrade a console on computers other than site servers, you can use any method that Configuration Manager supports to install the Configuration Manager console. These supported methods can include a manual installation or a deployment that installs the console. After you upgrade a primary site, plan to upgrade clients that are assigned to that site. Although a Configuration Manager primary site or secondary site can support communication from clients that have a lower service pack version (including clients that run Configuration Manager SP1 talking to a site that runs System Center 2012 R2 Configuration Manager), this communication should be a temporary configuration. Clients that run a previous service pack version of Configuration Manager cannot use the new functionality that is available with the new version of Configuration Manager. Use the following information to help you prepare for changes to sites and the hierarchy when you upgrade to System Center 2012 R2 Configuration Manager. If the site is the top-level site of a hierarchy, it updates the client installation package on each distribution point in the hierarchy. The site also updates the default boot images to use the new Windows PE version that is included with the Windows Assessment and Deployment Kit 8.1 and System Center 2012 R2 Configuration Manager. However, the upgrade does not upgrade existing media for use with image deployment. Ensure that clients that are assigned to each primary site upgrade and install the client software for the new version. At primary sites where you use database replicas for management points, reconfigure the database replicas for System Center 2012 R2 Configuration Manager. Actions that affect configurations and settings: When a site upgrades to System Center 2012 R2 Configuration Manager, some configurations and settings do not persist after the upgrade or are set to a new default configuration. The following table includes configurations and settings that do not persist or that change, and provides details to help you plan for them during a site upgrade. When you upgrade to System Center 2012 R2 Configuration Manager, custom summarization schedules for software updates or software update groups are reset to the default value of 1 hour. After the upgrade finishes, reset custom summarization values to the required frequency. You can install a new System Center 2012 Configuration Manager SP2 site, or upgrade an existing site that runs System Center 2012 Configuration Manager with SP1. The information in the following check list can help you identify and plan for pre-upgrade configuration modifications and additional actions related to upgrading your sites and hierarchy. Plan for prerequisites for new site system roles and, ensure site system servers still meet prerequisite for installed site system roles and connectors (like the Windows Intune connector), and run the Setup Prerequisite Checker. In addition to prerequisites for site system roles, some features might require updates as well, like the version of the Windows Assessment and Deployment Kit for use when deploying an operating system. For example, to deploy an operating system, System Center 2012 Configuration Manager SP2 uses Windows Assessment and Deployment Kit 8.1 instead of Windows Assessment and Deployment Kit 8.0. Before you run Setup, on the site server and on each computer that runs an instance of the SMS Provider you must uninstall the Windows Assessment and Deployment Kit 8.0, and then download and install Windows Assessment and Deployment Kit 8.1. Configuration Manager cannot successfully upgrade a primary site that has a database replica for management points enabled. Disable database replication before you create the backup of the site database to test the database upgrade, and before you upgrade the production site. For more information, see the Upgrade from Configuration Manager with No Service Pack to Configuration Manager SP1 section in the Planning for Software Updates in Configuration Manager topic. Download prerequisite files and redistributable files. Use Setup Downloader from the System Center 2012 Configuration Manager SP2 source media to download prerequisite redistributable files, language packs, and the latest product updates for the product version upgrade. When you plan to upgrade a secondary site that uses SQL Server 2012 Express with no service pack it is recommended to must first apply cumulative update 2 to the SQL Server 2012 Express installation on the secondary site server. This is because, when Configuration Manager installs SQL Server Express as part of a new secondary site installation, it installs SQL Server 2012 Express with no service pack and is unable to install the required cumulative update 2 as part of the installation. When you direct Configuration Manager to install SQL Server Express as part of a new site, the prerequisite check does not detect an existing installation of SQL Server Express, and then installs SQL Server Express as part of the site installation. System Center 2012 Configuration Manager SP2 supports the same server and client languages as prior versions. However, when you upgrade the site, the upgrade process installs new versions of each language pack. Server and client language packs are service pack version-specific. You cannot use the language packs from a different version of Configuration Manager with a SP2 site. For more information see the Setup Downloader section in the Install Sites and Create a Hierarchy for Configuration Manager topic. When you upgrade a site, some features and configurations reset to a default configuration. To help you plan for these changes in System Center 2012 Configuration Manager SP2, review the information in Considerations for Upgrading to System Center 2012 Configuration Manager SP2 in this topic. Before you upgrade a Configuration Manager central administration site or primary site, plan to test the site database upgrade process on a copy of the site database. The upgrade test is not required but can identify problems for the upgrade before your production database is affected. A failed site database upgrade can render your site database inoperable and might require a site recovery to restore functionality. Install System Center 2012 Configuration Manager SP2. For more information about how to install the console, see the Install a Configuration Manager Console section in the Install Sites and Create a Hierarchy for Configuration Manager topic. When you upgrade from System Center 2012 Configuration Manager SP1 to SP2: If the site is the top-level site of a hierarchy, it updates the client installation package on each distribution point in the hierarchy. The site also updates the default boot images to use the new Windows PE version that is included with the Windows Assessment and Deployment Kit 8.1. However, the upgrade does not upgrade existing media for use with image deployment. When you upgrade from System Center 2012 R2 Configuration Manager to System Center 2012 R2 Configuration Manager SP1: Because System Center 2012 R2 Configuration Manager uses the same version of the Windows Assessment and Deployment Kit 8.1 as System Center 2012 R2 Configuration Manager, there is no update to the default boot images. At primary sites where you use database replicas for management points, reconfigure the database replicas. When you upgrade from System Center 2012 Configuration Manager SP1 to SP2: Plan to update non-default boot images when you do not require the original (older) version of Windows PE. When you upgrade from System Center 2012 R2 Configuration Manager to System Center 2012 R2 Configuration Manager SP1: Because System Center 2012 R2 Configuration Manager uses the same version of the Windows Assessment and Deployment Kit 8.1 as System Center 2012 R2 Configuration Manager, you should not need to update non-default boot images. Confirm in the Microsoft Intune connector that Windows Phone 8 and Windows Phone 8.1 are checked. Confirm the Company Portal app remains deployed. As a best practice you can remove the uninstall package for the Company Portal app, it is no longer needed. On the Requirements tab, if there are no Requirements listed, click Add to add one. For all Requirements that contain an operating system condition, ensure that only Windows Phone 8 is selected. This setting no functions as Windows Phone 8 and later. Ensure Windows Phone 8.1 is not selected. Actions that affect configurations and settings: When a site upgrades to System Center 2012 Configuration Manager SP2, some configurations and settings do not persist after the upgrade or are set to a new default configuration. The following table includes configurations and settings that do not persist or that change, and provides details to help you plan for them during a site upgrade. When you upgrade to System Center 2012 Configuration Manager SP2, custom summarization schedules for software updates or software update groups are reset to the default value of 1 hour. After the upgrade finishes, reset custom summarization values to the required frequency. This section applies only when you upgrade a hierarchy that runs System Center 2012 Configuration Manager SP2 to System Center 2012 R2 Configuration Manager SP1. If you are upgrading a System Center 2012 R2 Configuration Manager site to System Center 2012 R2 Configuration Manager SP1, see Planning to upgrade to System Center 2012 Configuration Manager SP2. When all sites in a hierarchy run System Center 2012 Configuration Manager SP2, you can upgrade the hierarchy to System Center 2012 R2 Configuration Manager SP1. Run the System Center 2012 R2 Configuration Manager SP1 installation at the top-tier site of a hierarchy. Unlike a Service Pack which must be installed on each server, you run this upgrade only once at the top-tier site of your hierarchy. This action then enables System Center 2012 R2 Configuration Manager SP1 features to each site in the hierarchy. To run setup for the upgrade, your account must have local administrator permission to the server. Because this upgrade enables additional functionality and does not upgrade features and components, there are no considerations or changes to settings or site system roles as there is when you install a new service pack. Additionally, configurations typically affected by upgrades to Configuration Manager, like the Windows Assessment and Deployment Kit 8.1 version and boot images, do not require any update. After the upgrade to System Center 2012 R2 Configuration Manager SP1 completes, restart any active Configuration Manager consoles. However, Configuration Manager does provide limited support for uninstalling updates from clients. Updates are installed when you deploy updates from a cumulative update to a Configuration Manager client. For more information about updates, see Update System Center 2012 Configuration Manager. If you plan to uninstall a site that runs System Center 2012 R2 Configuration Manager SP1 and then reinstall that same version on the same computer, do not use Setup to uninstall the site. Instead, uninstall the site by running configmgr2012r2sp1.msi from the System Center 2012 R2 Configuration Manager SP1 media. If you uninstall the site using Setup and then reinstall the site, the capabilities provided by R2 will not be available. Use the information in the following sections to help restore Configuration Manager to an earlier service pack version. Configuration Manager does not support the removal of a service pack to restore a site to a previous version. Instead, uninstall all site system roles and then run setup and select the option to uninstall the Configuration Manager site. After the site is uninstalled, you can then reinstall a site with the version of Configuration Manager that you require. However, because sites in a Configuration Manager hierarchy share a common database, you cannot uninstall a site without first uninstalling its child sites. Additionally, when you reinstall sites, you cannot install a site that uses a lower service pack version than its parent site. See Decommission Sites and Hierarchies for more information about uninstalling Sites. Configuration Manager does not support the removal of a service pack version from a Configuration Manager client. Instead, uninstall the client, and then reinstall the client software from the appropriate Configuration Manager version. Configuration Manager does not support downgrading a Configuration Manager console to a console of a previous version or service pack. Instead, uninstall the Configuration Manager console, and then reinstall the Configuration Manager console for the version that you require.